how civil society in the global south can also persist in making clear to INGOs that military spending IS a ‘development’ issue. For hundreds of years western elites and governments have pursued their own interests on the continent. Today the place where western aid meets military aid meets foreign policy objectives meets energy or security interests on the African continent is hugely complex, but we need to make clear – it is part of the development agenda. Such campaigns work is at its most powerful when the south/north partnerships are forged early and with common cause. The 5% proposal is just at its beginning and will only succeed with shaping, contextualising and joint campaigning with future partners in the global south. 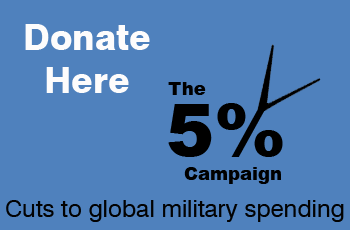 “Militarism is probably the world’s largest barrier to ending poverty. Whether it be armies and weapons of war, or small arms flowing into our neighbourhoods and local communities, militarism destroys communities, wastes resources and prevents sustainable development. Military and weapons spending consumes resources that could be applied instead to human needs. The flow of arms into a conflict region destroys democratic and traditional control structures for land-use, production and the economy and replaces this with warlords, gang leaders and militias. And the use of military vehicles – aircraft, ships, rockets, tanks, armoured vehicles – in exercises and military operations constitutes possibly the largest single global contributor to carbon emissions and climate change. A high level of militarization of a state is also likely to hinder effective governance and encourage corruption. Time and again we see how powerful military interests influence political processes in order to favour their own positions or line individuals’ pockets. Moreover, over-militarization tends to fuel regional tensions which may lead to an arms race, hampering the sustainable development of both the country itself and its neighbours. A relevant indicator of such militarization would be the ratio of military spending totals to the amounts spent by governments on health and education. The arms trade drives the gargantuan amount spent on ‘defence’ every year – $1.6 trillion in 2010 alone…It accounts for almost 40 per cent of corruption in world trade. The very small number of people who decide on multibillion dollar contracts, the huge sums of money at stake and the veil of secrecy behind which transactions take place (in the interests of ‘national security’) ensure that the industry is hard-wired for corruption. I experienced this first hand as an ANC Member of Parliament in South Africa’s nascent democracy. At the time that our then President, Thabo Mbeki, claimed we did not have the resources to provide life-saving medication to the over five million people living with HIV/AIDS, we spent $10 billion on weapons we didn’t need and barely use today. About $300 million in bribes were paid to senior politicians, officials, go-betweens and the ANC itself. The British company BAE Systems contributed $180 million of the bribes and received the biggest contract, even though the jet it sold had not made an initial shortlist and was two and a half times more expensive than the plane desired by the air force. The time has come to lift the veil on this shadow world, to demand that our taxes are not used to develop another deadly weapon for the material benefit of a tiny self-serving élite, but are rather employed to enhance the lives of those who go hungry, who are without work or who suffer the deadly consequences of the trade in arms. Like so many cross cutting issues, we would argue that runaway military spending impacts on many of the 17 SDGs but there is a great deal of awareness raising that needs to be done for this to be more fully appreciated. SDG 16 – the last but one – does not go far enough. It is tasked to promote just, peaceful and inclusive societies. High levels of armed violence and insecurity have a destructive impact on a country’s development, affecting economic growth and often resulting in long standing grievances among communities that can last for generations. Sexual violence, crime, exploitation and torture are also prevalent where there is conflict or no rule of law, and countries must take measures to protect those who are most at risk. The Sustainable Development Goals (SDGs) aim to significantly reduce all forms of violence, and work with governments and communities to find lasting solutions to conflict and insecurity. Strengthening the rule of law and promoting human rights is key to this process, as is reducing the flow of illicit arms and strengthening the participation of developing countries in the institutions of global governance. Arms Flows. This is a good starting point from which to expand the debate in order to take on board the (much) wider ramifications of this one target within SDG 16. More often than not, the lines that separate the ‘goodies’ (eg governments) from the ‘baddies’ in the arms trade are (deliberately) blurred as author Andrew Feinstein makes clear in his book ‘The Shadow World’. And the use of the word ‘illicit’ also begs a question: where it is the case that arms sales are legal, does it automatically follow that this is a good enterprise between buyers and sellers (ie arms industries, defence corporations and governments)? Approximately 70% of arms sales are made by the P5 members of the security council, the same five nations charged with keeping the peace of the world (USA, France, UK, Russia, China) – and the majority of those arms sales go to the global south. While we all live in the real world and understand that weapons will be made, sold and used, the distinction between ‘good’ arms sales and ‘bad’ arms sales is not helpful, self defence or freedom struggles notwithstanding. THE CASE FOR DEVELOPMENT AGENCIES TO TAKE ON MILITARY SPENDING: IT IMPACTS ACROSS THE BOARD ON THEIR WORK AND THEIR ONGOING CAMPAIGNS. There is an elephant in the room for international campaigning development agencies. By joining the ranks of debt cancellation, financial transaction and other tax related measures, military spending savings could be regarded as yet one more significant ‘new’ revenue stream, redirecting the funds captured to serving the needs of the global community. First Decade: We call for decade long absolute and annual cuts of 5% to top 20 military spenders. The top 20 spenders account for 87% of all military spending. This delivers a 10 year compound cut of 40% to global spending delivering an estimated $700 billion to be redirected to core urgent human and environmental needs. $350bn for International needs: Immediate and urgent poverty reduction; sustainable development reflecting civil society activism on climate & economic justice; Peace/conflict prevention & human rights; investing in the global green economy. $350bn for Domestic needs: counteracting effects of austerity on public services; investing in clean, green jobs. After 10 years we will have reduced annual global military spending to the mid 1990s level of $1 trillion – still way too high but the lowest level in recent history. The annual global military spending is now close to $2 trillion. At this stage, we call upon all nations to adopt the 5% threshold rule to sustainably restrain the global military spending. No country increases military spending to outstrip its economic growth. The formula is designed to be mainstreamed into budgeting beyond the first 10 years, acting as both a military expenditure ‘dampener’ and a economic growth ‘accelerator’ for all nations, while facilitating and enabling the public to more deeply interrogate the many inter-linked issues of the military spending debate. The 5% Threshold rule – for example: 0% economic growth = 5% cut to annual military spend; 2% growth = 3% cut to annual military spend; 5% growth = no increase; 7% growth = only 2% increase on annual military spend. Most economies grow less than 3% annually; this effectively translates as 2% annual reduction to their military spending. These savings are then divided equally to fund both domestic and international needs. The 5% Formula allows every nation – relative and proportionate to its economic growth – to share in ‘sensible’ defence budgeting with the long term effect of acting as a dampener on arms races. Military spending is one of the least efficient ways of investing our limited resources to advance economic growth and prosperity; thus, the significant outpacing of its increase to the economic growth is harmful to the real economy and consequently wider society. the USA has bases across the African continent, is building a drone base in Cameroon (The Intercept Feb 2016); France has bases across the continent east to west and China and Japan have each opened up their first base in Djibouti. there is a great deal of scope to ‘twin’ campaign groups across buying and selling nations. Don’t Buy Don’t Sell is a sub-campaign of Five Percent. This proposal stands on the shoulders of those in the peace movement who have long campaigned on the war-spending/arms trade issues, but it is an area that the major players in the development sector have not sought to take on in the same way with the same courage. Moreover, given development is interlinked with climate change and the military has a major (albeit relatively unknown) role in climate change, this proposal also speaks to everyone concerned with climate change.